About 12 months ago, during a guitar session with a friend (and probably with one too many beers in my system), I made the point that a violin would make a great backing instrument for the sort of music we play (lots of blues stuff, often in open D and slide). He agreed. I don't really recall the rest of the conversation but apparently I committed to buying one and learning. Now, I'd always wanted to play the violin but never said or did anything about it. I spent about 10 years learning the piano as a kid (and still play today when I can). I play the guitar a bit, mess around with other instruments and spend a bit of time in software like Ableton Live. So about 25 years of doing something musical. But man, the violin?... It always seemed way too daunting to pick up. So I started spending a bit of time online looking around and reading. Watched lots of YouTube videos (most by a certain hat-wearing fiddler or an English violin and piano teacher) and I was thinking it might be possible to learn the basics online. Then I found out my parents figured this crazy idea I'd briefly mentioned in conversation was 100% serious - they'd decided to buy me a violin as a Christmas gift. And so on Christmas day I had a card with a blank cheque inside, a Kun shoulder rest and a rubber violin mute. I'm sure the neighbors will really appreciate that last one. So here I am. After two weeks I've had quicker progress than I expected. I'm also enjoying it way more than I thought I would. I can't stop taking it out of its case and messing around. Looking forward to seeing where this all goes. I'm also a guitar player, and spent a lot of years always kinda wanting to try violin, but never actually doing it. All the talk of how hard the instrument is to play and how expensive they are and etc. But almost 3 yrs ago I finally gave in to temptation and started giving it a try, and i would agree with you. Challenging instrument, yes.. But also a lot of fun! .......I can't stop taking it out of its case and messing around. Welcome aboard @caterwaul - I sense the enthusiasm, the desire to play, the love of playing music in general - it sounds like you're going to fit-right-in here !!! Enjoy the journey ! Welcome @caterwaul You should find the ease of expression on violin to be ... Satisfactory. Welcome and thanks for sharing your story. 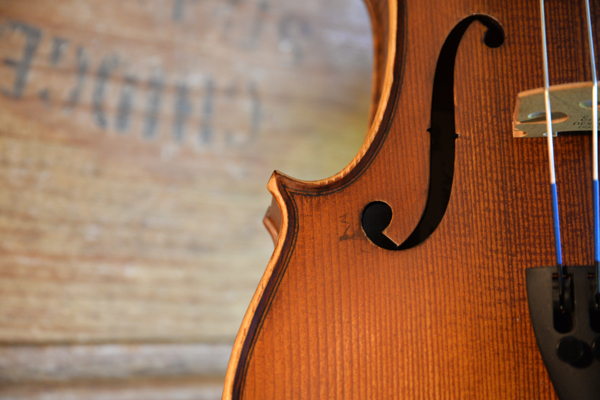 Have a fantastic journey with the violin. I look forward to hearing more. Welcome to the forum caterwaul! I have always had the ability to quickly learn to at least pick out a basic riff on about any musical instrument I have tried. Thinking the fiddle might be a cool addition I added one to my wide collection of instruments. This one is tough for me. Working on basic bowing technique, but not feeling it yet. Not giving up, but not yet getting it either. Results could so far be described as the voice of the devil. The bow is what takes the most work. It is also where most of the sound of the instrument is. Doesn't that just figure? But as you get more comfortable with the bow, everything will sound better. Just keep at it and you'll do fine. Thanks for the welcome everyone - one thing I've noticed reading the posts on this forum is you all seem to be a friendly bunch! Results could so far be described as the voice of the devil. Heh, yeah I know what you mean Mark, I'm kind of the same. Lack of frets is gonna take a lot of getting used to. I'll save working on improvising killer solos til after I've got that bit sorted. With the piano and guitar under your belt you should learn a bit quicker than normal. Sounds like you have some cool parents that surprised you with that. It's a Kreisler #120. I figure the brand name is irrelevant... I spent ages researching before making a decision but only found them referred to at this shop. It's Chinese made. Purchased as an outfit, case, bow etc. I think the shop just has them branded with their own label after being shipped here to Australia and set up by their luthiers. Maybe known under other names elsewhere? They do the bridge, nut, soundpost, strings, pegs etc to their specs. They only sell and service orchestral strings, so they probably (?) know what they're doing. 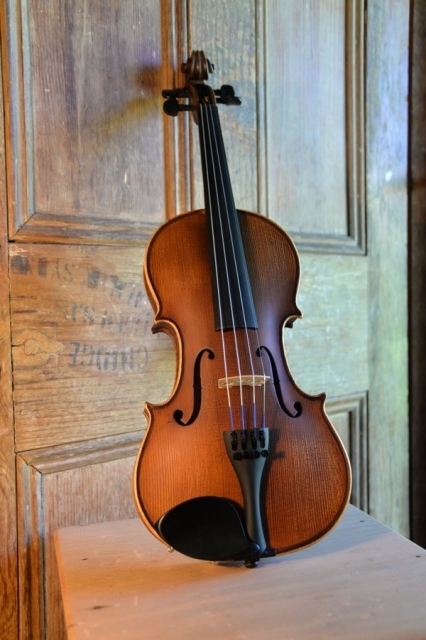 This is one of their entry level violins and also the cheapest. Satin finish. Maple and spruce. Ebony pegs, fingerboard, chin rest etc etc... The usual stuff. You'll notice in the closeup photo of the f hole theres a squiggle of black on the spruce... looks like someone at the factory had a bad day blacking in the edges! When I noticed it I felt like I should probably be annoyed, but I wasn't... I'm totally ok with it. I don't know why. Imperfections are interesting? "There are many like it, but this one is mine". Warchal Ametyst strings (synth core, silver / hydronalium windings, stainless E string). In the end, I really liked the sound of this over the Gliga II and III, Raggetti RV5 and other instruments I looked at. It was about the middle of my price range too. I thought about going a bit more up-market, but since I'm just starting out I didn't see the point. If it sounds good and I enjoy playing it, I wouldn't care if it only cost $100. Issues? None really... Some peg slipping at first, but I put that down to the summer weather we have here this time of year - hot and dry one day, hot and storms the next. Bought a D'Addario NS Micro tuner to help with retuning... it's brilliant. Anyway. Enough talk, photo time! 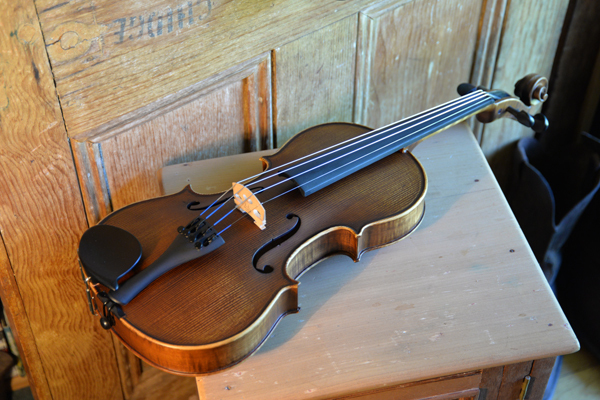 "Watched lots of YouTube videos (most by a certain hat-wearing fiddler or an English violin and piano teacher) and I was thinking it might be possible to learn the basics online"
Another avid viewer of those two YouTube channels here! Welcome @caterwaul! 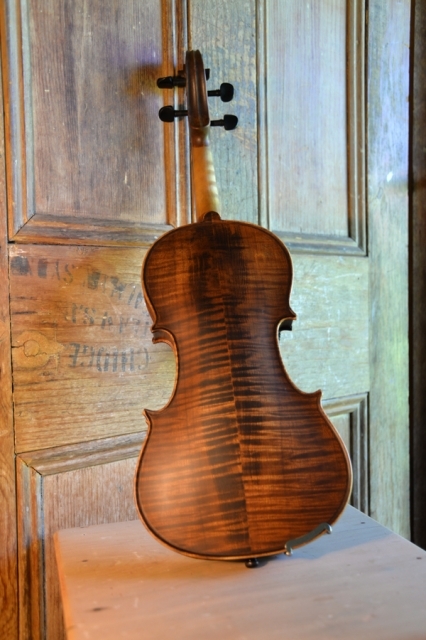 What a great story And beautiful pics of your violin. Enjoy!